From the main station take Tram Number 10 direction Zurich Flughafen (or Bahnhof Oerlikon) to "Universität Irchel" (about 10 min -- see public transportation). 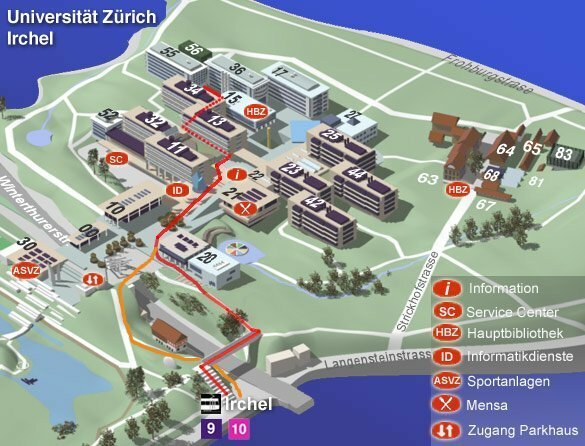 Follow the arrow "Universität" , and you will end up on the broad walkway. There is a reception (information) inside building 23 on the right-hand side when you enter. Our building is BAU 55, left of the broad walkway and the entrance to our institute is on the left, just as you enter the building. (Motorway N3 from Chur, Sihltal from Gotthard, Luzern). Follow the motorway N3 until the end. Then following the signs towards Winterthur, St.Gallen and Flughafen Kloten you will cross the Limmat Valley on the EscherWyss Bridge and go straight up the hill to the top. There you should see a sign directing you to the right to "Uni Irchel - Parkhaus" , the Campus underground parking lot, where you can leave your car. Do not go into Zürich. Instead follow the north branch of the motorway towards Winterthur and St.Gallen. At the "Dreieck Zürich-Ost" take the branch towards "Zürich, Chur, Luzern" , leave the motorway at the "Zürich-Schwamendingen" Exit and follow the white signs towards "Irchel" until you see a sign pointing towards "Irchel - Parkhaus" , where you can park your car. These directions also apply if you come by rental car from Zurich-Kloten airport. At the "Dreieck Zürich-Ost" take the branch towards "Zürich, Chur, Luzern" . Leave the motorway at the "Zürich-Schwamendingen" Exit and proceed as described above.